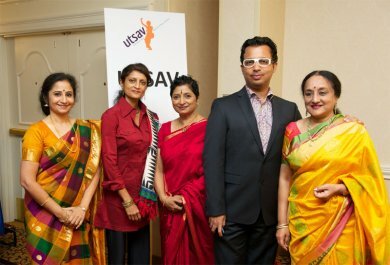 I was invited recently to be the convener of the Panel Discussion session on dance at the UTSAV festival in Washington D.C. It set about some thinking among the teachers based in the USA. When the panelists send their abridged versions perhaps I can put some points raised by them across to my readers. Hari Krishnan, Anuradha Naimpally, Sujatha Srinivasan and Malathi Iyengar expressed their views coherently. At the outset, I decided to have an umbrella topic, which was TRADITION AND INNOVATION IN CLASSICAL DANCE TODAY. I felt that this was a topic worth discussing as Indian dance has today many teachers and many performers all over the world and they have a voice which must be heard. Innovation is inevitable and it is part of the creative process for mature artists. What works and what does not has to go through the process of development and approval. Authority to innovate is something individuals have to know how to validate. A well informed and conscious artist knows how to innovate without violating certain highly held principles in classical dance. Dance has become a fashion and a passion, with thousands of dancers coming out every year to stake a claim in the performance space. That space has grown but it cannot keep pace with the sheer numbers. The more is merrier for society at large. But is it enhancing the art itself? We have reached a point where there seems to be a debate in the minds of dancers regarding what is classical, and whether it can hold its own in a changing world. I always like to compare the classical with pure gold. You may have many things that glitter, but....! When one watches a performance of legends like Pandit Birju Maharaj, you know that he has stayed the course and is able to deliver the essence of his classical Kathak dance to both experts and laymen with authority. Sure there are imperceptible changes in his approach. But he remains true to his tradition with uncanny sensitivity. Kathak is formatted in a way to draw audience applause. You can call it the old style of presentation which Birju Maharaj follows implicitly. Classical dance and music are parallel streams. He adheres to this idea without compromise. The sound identity is as important as visual identity in classical dance. In Bharatanatyam, compositions like Varnams or Thillanas in familiar or rare ragas have been used to enlarge the repertoire in the last fifty years. They have become popular and have their own identity. There was a time when Nattuvanars were so particular that even "kritis" composed by the Trinity of Carnatic music were frowned upon as unsuitable for dance. They stuck to a traditional repertoire. All that has changed. Now that we have a worldwide presence there is some anxiety about identity and reputation. Who can validate innovation? It is here, like in all other matters around us, the truth versus hype conflict begins. It is a matter of concern that independent dancers, who are not guided by their gurus or teachers, set trends. If their experiment with content or technique works, there are many who want to follow that trend. In such instances the following are the points to ponder about. Is there an aesthetic standard in such innovation? Is there a clear understanding and full use of the authentic technique? Perhaps many are more worried about the entertainment value. Sure, that is a valid point. But can classical dance anywhere in the world be authentic and still compete with popular entertainment? In the West, after several decades of hard work, Modern Dance has found a place almost equal to Ballet. The two are different streams, yet are taken equally seriously. In a hundred years we already have had rapid and radical changes. We are not satisfied with that. We want more changes. Yet we want certain stamps and certification of authenticity and classical. All styles of dance suffer from this predicament. There are also many self professed experts. If somebody markets their innovation well enough, the experts are ready to join the bandwagon of approval. They are not gurus but followers..... the Pied Piper is dance itself.